Recently, a dog in Jerusalem got uppity and entered the courts and would not leave. This prompted some judges to remember that they had cursed a lawyer 20 years early to have his spirit enter a dog, because in traditional Judaism dogs are impure creatures. Naturally, they issued a verdict that the lawyer dog should be stoned to death. Luckily for the dog, it escaped before its sentence could be carried out. “A Jewish rabbinical court condemned to death by stoning a stray dog it feared was the reincarnation of a lawyer who insulted its judges, reports say. The dog entered the Jerusalem financial court several weeks ago and would not leave, reports Israeli website Ynet. It reminded a judge of a curse passed on a now deceased secular lawyer about 20 years ago, when judges bid his spirit to enter the body of a dog. 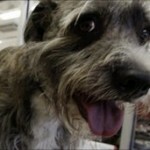 In a scene right out of The Wizard of Oz a dog survived a 20-mile flight through the air. 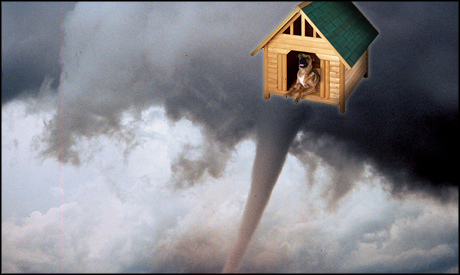 Strong winds in Gesztered, Hungary lifted the dog, who was seeking shelter from the storm in his dog house, high into the air. When the newly-renamed ‘Lucky’ was found by the combined efforts of the Red Cross and it’s owner it was shaken but otherwise unharmed. 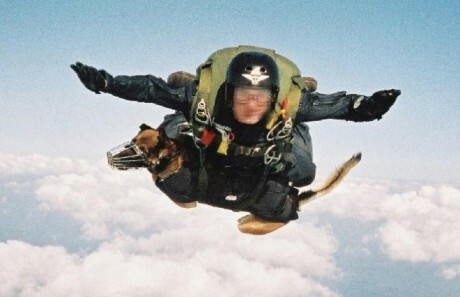 Was this an accident with a happy ending, or are dogs just now catching up to the Wright Brothers?